rebecca likes nails: piCture pOlish blog fest 2012! Some of the polishes being showcased in Blog Fest today are from piCture pOlish's brand new Collaboration Shades. The collection features 7 shades created in conjunction with bloggers and members of PP's network of sellers. When polish-addicts and polish-companies join forces, you know you are in for something awesome. I'll start with my favorite of the two polishes (and probably my new favorite piCture pOlish ever) - Pshiiit! A polish created with Camille of Pshiiit and Pshiiit Boutique. As you may know, I love any polish in the teal/turquoise color family so this was so exciting to find inside my package from PP. The color... The shimmer... The flakies... It's too much! I kinda matched my jeans to my polish when I wore this shade for the first time. Teal acid wash jeans + teal flakie polish. Clearly I was smokin' that day. The flakies. Look at them. This is only two coats, and it covers beautifully. Great formula. If you're familiar with Camille's blog and her beautiful photos, you'll know that she often poses her hand with some seriously cute jewelery. I searched and searched for the perfect item to pose with but I kinda failed. I am officially jealous of Camille's jewelry collection. Okay. So of course I couldn't have a polish made by Pshiiit without using it to recreate some of her manicures! I just love these triangles, they're so chic. I used another color by piCture pOlish to create the triangles - the glittery pink color you see is piCture pOlish - Antique. I made them with tape for clean lines. Antique and Pshiiit aren't colors I would normally pair together but I really like how it turned out, the contrast is cool! Antique is a great polish for tape manis like this because the glitter is super tiny and dense, and it covers really easily. How about another Pshiiit mani? I'm still swooning over this polish. Look how gorgeous it is. 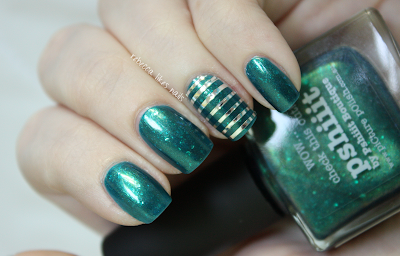 And the striping tape added such a fun element to the mani. Phew! That's all I have to show you for that one, girls. I hope it delights you as much as it delights me. I'm not pshiiitting you - you need this polish. A polish created with Sara of Sara Hassan's Blog. This polish can be worn alone or over black, so of course I will show it both ways. I first wore this polish on its own as a delicate light gray-blue with very intense shimmer that shifts in color. It takes three coats to build to this opacity. See the duochrome? I love how it turns purple. On its own, this polish is very pretty but not overly exciting. I added some stamping to spice it up a little! It was really hard to capture because Mirage is so freakin' reflective, but I stamped over Mirage with Pshiiit! It created a very subtle look - almost like a mirage. See what I did there? Haha! Over black, it's a whole new ballgame. It looks more blue overall and the duochrome becomes more intense, it makes you wonder how one polish can be so drastically different when layered. Can you believe this is just one coat of Mirage over black? Mmmmm, look at the purple shift. This polish really shines over dark colors. Of course, some art happened on top of this combo too. Not really sure where I was going with this one, but I felt like the polish needed some swirly art. I like how it turned out! I added black swirls on top of Mirage-over-black on my fingers, and on my thumb I switched it up - black base with swirls of Mirage. I love how the thumb turned out. Wow! We've almost made it to the end of this post. Last thing - I wanted to quickly show you guys these cool QR-code labels on the PP bottles! Scanning those bad boys with a smartphone will send you to the shop where the polish came from. Pretty cool. Technology and polish. I'm into it. I adore my little collection of piCture pOlishes because I know that each one was made with love by a bunch of girls who really love what they do. A million thanks to PP for being so darn awesome! I can't wait to get my hands on more of the shades released today in Blog Fest because holy crap, they are gorgeous. You can find all of these polishes on the piCture pOlish website. Pshiiit is also available in the Pshiiit Boutique. Be sure to check out piCture pOlish on Facebook, Twitter, and Pinterest to keep up with all their news, as well as find links to the other girls participating in today's Blog Fest! Lots of love to piCture pOlish! Have a great day everyone! omgosh pshiit is the best i've ever seen!!!!!!!!! Pshiiit is amazing! :) Flakies = LOVE. Oh they are both so beautiful but I have never seen a polish quite like mirage!! I love the designs that you created with these!! Love! Pshiiit on you!! <3 Beautiful pics Rebecca! beautiful post! you have beautiful nails! Ah ! You totally got the Pshiiit thing. Cute jewels, perfect nails and TEAL polish ! Camille's baby is way gorgeous <3 I'm so jealous you alrealy have it ^^ Love your nailarts though ! Specially the one with the stripping tape. Loving it! Great swatches! I love Pshiit (the blog and the polish :p )! mirage is also cute on its own!! i LOVE that mani, stunning! Great swatches and art, as always! I love how you show lots of ways to wear these! You have best swatches of Mirage!